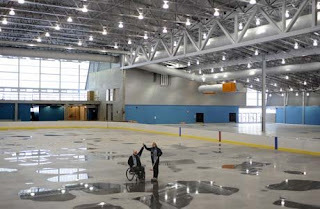 Amazing facility and great story highlighting the sport of wheelchair curling and the Paralympic Games. I thought, however, that the 2010 team was not selected yet and that the team would be once again selected from scratch. This doesn't seem to be the view from Armstrong's perspective: "I would hope with any kind of showing there, plus or minus one or two changes, that team will certainly be the core for 2010." I read it as it should be interpreted....He hopes that with a good showing in 2009, that the 2010 team will be at least the core 2009 team, allowing for one or two (out of 5) possible changes. Is Jim the only guy that curls from a wheelchair? He is without a doubt the only person the media knows. Does he seek it or do they find him? I know they find him. He is notorious within the curling and dentistry worlds, intelligent, articulate, shows a passion for our sport, and ALWAYS politically correct. The WCF should simply hire him as the media contact, with this site the primary venue. The CCA should do the same, in my opinion. Did you notice that the writer is not even a sportswriter? Armstrong generates a ton of interest, and should be commended. And some of you guys didn't think he belonged last year? Best thing that has happened to us. For the purposes of any further discussion on this blog it is stipulated that Jim Armstrong's degree of disability is sufficient to convince the WCF's eligibility advisor that he qualifies to compete at WCF events. It is also stipulated that concerns about Jim's presence on the team were the result of doubts about his eligibility to compete at WCF events, and not his qualities as person, or his value to the sport in general or Team Canada in particular. Have the ability to repost the last comment now removed and stay on the issue about disability. I know you are. How do you feel Eric, being someone who is truly disabled losing the possibility of participating to someone with bad knees and a bad back. Wait, do I see Russ Howard coming to play...the door is open when we do not have clear definition of disabled. The point here is not about eligibility but disability. Any, organization given enough pressure by a major member will and does allow for eligibility to be changed. Try asking CPC or the CPF there thoughts on what counts as disabled. How many people lost a spot on this team to an eligible rather then a disabled player? Please, have the courage to publish this! Jim is an asse to this sport. We don't even know yet how much he will help our cause. I'm prepared to post any considered opinion that furthers the conversation - nothing to do with courage; more a matter of relevance and good taste. I think a debate over the definition of disability can be useful as it pertains to eligibility for wheelchair curling, but to say that Armstrong is not disabled is just silly. Presumably you mean "not sufficiently disabled." I think it is a reasonable to question whether Armstrong should have been passed by the eligibility assessor on a reading of the rules as they currently exist, but the fact is he was and I accept that. That decision is likely to bring benefits to the sport far beyond improved medal prospects in 2010. I have posted elsewhere the criteria I think should be adopted for eligibility, to balance equity and inclusiveness: inability to participate in the sport of curling without use of a wheelchair. But frankly my personal opinion is that all artificial criteria are inherently corruptable, and I would be in favour of allowing anyone to play who is willing to sit in a wheelchair. This wouldn't be an issue had not the Paralympics made wheelchair curling such a symbol of national pride way in advance of the development of an infrastructure to support it and develop it into what I hope it will become - the winter recreation of choice for Canadian wheelchair users. You bring up very valid points. Everyone should remember that the WCF werre certainly not motivated to approve Armstrong for play, but upon examination, and I believe a lengthy process, did approve him. Your othr point is very valid: what benefit does Armstrong have when throwing from a wheelchair? You cannot penalize him because of experience or the fact that he is good....remember the Darryl Neighbour's of our sport have had many more years than Armstrong to be better than him from a wheelchair, but Armstrong is simply GOOD. Furthermore, Darryl should be asked what it is like to play with Jim.....I see them all the time at Richmond, and I know Darryl thinks the world of the Big Guy. As you say, Eric, make the rules INCLUSIVE, not exclusive to only spinal cord injured players. We all want this sport to grow and mature to reach as high a level as possible, and Jim will certainly help achieve that goal. What does this poor guy (Armstrong) have to do? He plays by the rules, is an obvious asset to the sport, but still gets hounded about eligibility. Doesn't everyone understand the benefit of having this guy in our sport? Should he go back to Scotland for another assessment? According to the president of the WCF in an interview last season, amputees should not be playing, yet do. Where is the army attacking these guys? Armstrong has done everything right. PERIOD. Let's restrict pay to quads only...or are they potential not disabled enough? Somewhere from able-bodied to quads is the cut-off. If you don't like the position the WCF has taken, criticize them not Armstrong. Armstrong was a martyr for the ill-informed last year. He gets assessed by the ONLY assessor in the world, and it is still not good enough? If you don't like it, QUIT. HOW CAN ANYONE POSSIBLY QUESTION ARMSTRONG? IF THERE WERE ANYTHING FURTHER TO DO, I AM SURE HE OR THE CCA WOULD BE HAPPY TO ACCOMODATE. THEY HAVE DONE EVERYTHING TO ASSURE THE INTEGRITY OF THE SPORT AS IT IS WRITTEN TODAY. HAND ON TO YOUR HATS, PEOPLE.....THE WCF POST 2010 WILL BE LIBERALIZING ELIGIBILITY TO CONTINUE TO IMPROVE PARTICIPATION. Just got caught up on the Armstrong eligibility issue/non-issue. Armstrong started down this road with a concern regarding eligiblity. He, through the CCA, informed the WCF of his and or their intent. Not enough info, and the WCF flexes muscles and says no way. CCA and Armstrong accepts this, and he simply helps the Canadian program as an one-ice coach, or whatever. He does not get paid, does not even get expenses for last season. Yes, I have trouble believing there is even any issue about eligility. He has been medically assessed by the only assessor in the world, and has been declared eligible. Now, can he help Canada enough to put us on the podium after only one season of practice...that is the bigger issue. Great points...there cannot be any issue about Jim's eligibility...he was approved by Europeans who would be happier if he couldn't play. Just got up to date on the Jim Armstrong eligibility issue. Has anyone done a head count of the approved WCF's eligible players? I will bet that no more than one-half of the athletes playing are actually FULLY wheelchair dependent for mobility.....How can the "host hotel chain" for World Championships only have enough "accessible rooms" to accomodate perhaps one fifth of the players? Dowe have "mobility questionable" players????? ?